He played in Max Richter‘s Popsy as Sheridan. Dan Berg: I just turned 30 years old and moved back to the west Chicago suburbs from LA a little over a year ago. I was living in Hollywood for two years, pursuing my dream of becoming a full time paid actor. California was very expensive and family was far away, so I decided to return to my true home in the Fox Valley area of Illinois. I was able to book a national Walmart commercial that ended up playing during the Chicago Cubs World Series in 2016 before I left the sunshine state! I’ve been supporting myself by working in the service industry as a bartender and server for the last 10 years. The flexible hours and fast cash allowed me to invest into my acting career, working many independent and student film gigs along the way. I recently decided to leave the service industry to try my hand in Real Estate as a broker for Baird & Warner. I hope that my new occupation will allow me to generate more income in order to further pursue my acting career. Dan Berg: I’ve been putting on shows and playing characters since I was a kid. I got my first taste for the stage in 6th grade when I played Huck in the stage play The Adventures of Tom Sawyer. When I realized I could make a whole room of people laugh by “playing pretend” on stage I knew that this is what I wanted to do for a living. Dan Berg: I saw the casting call on actors access and thought that the Dollar Baby program was an awesome idea. I immediately submitted to audition. Dan Berg: I enjoyed the audition process as well. Max Richter (Director) had actors chose a scene or monologue from a Stephen King screenplay and I was thrilled to have my choice in the matter. I chose the final scene in Secret Window. Dan Berg: Max is a young director who clearly worked hard to make this production happen. I was impressed by his vision and his patience in working with everyone on set. Dan Berg: The actor who played the young boy never ran out of energy. He was running around all day, having fun, being a kid. But the moment we got the shot ready and Max called “action,” he was a professional actor who hit all his lines EVERY TIME! Honestly, he knew his lines better than I did! Dan Berg: Erin Grote was on sound for the production and we still keep in touch. I’ve also talked with Max through email. 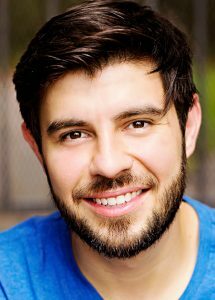 Dan Berg: I am currently involved in a large project with a production company I help manage called Wadworth Productions. It is a web series called Separate Checks. It’s a comedy that follows the story lines of characters working in the service industry. Dan Berg: Absolutely! He is one of the most talented authors of our time. Dan Berg: I used to pursue rap and hip hop as a producer and artist.